So, you’ve just bought your brand new DJI Spark? Nice! Now for the annoying bit, finding the right case for your precious drone. But, fear not! We’ve compiled a list of the 7 best DJI Spark cases currently available. The next item on our list of the best DJI Spark cases & backpacks is the Lowepro CS 80. Here at Drone Riot we’re big fans of Lowepro, they’re geniuses when it comes to building practical and protective cases and the CS 80 is no exception. 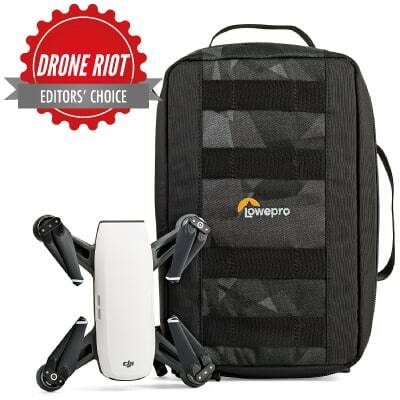 Although this bag was originally designed to carry action cameras, drone enthusiasts across the world have realised how well suited the CS 80 is for both DJI Spark and Mavic models. But, why I hear you ask. Lets find out. In my opinion, the CS 80’s designed to be both carried on its own and be able to fit inside another bag. If you want another layer of protection between your drone and the outside world, the CS 80 should fit easily inside another backpack. The Lowepros’ soft-sided constructions and padded interior offer fantastic protection from the inevitable knocks that the bag will encounter. You can put your faith in Lowepro, from years of experience they’ve mastered the art of creating bags designed to carry expensive equipment. The CS 80 is constructed from weather-resistant polyester, that’s both protective and long lasting, so you wont need to buy a replacement any time soon. The inside of the CS 80 is completely customisable, meaning that it’s not only a great backpack for your DJI Spark, but for any other equipment you may have as well. The smart interior has a built-in memory card pocket and elasticated accessory panels that are perfect for storing a spare set of props. The customisable inside means that it’s not only a great backpack for your DJI Spark, but for any other camera equipment you may have. On the inside of the backpacks lid is a compartment perfect for storing cables and other equipment such as an iPad mini. ​It seems that Lowepro have unintentionally designed one of the best DJI Spark cases around. 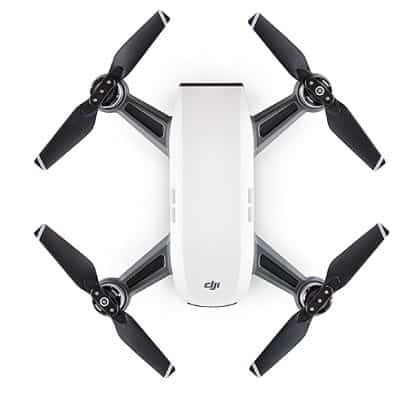 It’s affordable, extremely practical and will act as a great home for our DJI Spark. First on our list of the best DJI Spark cases is the Polar Pro. Some of you may be familiar with Polar Pro as they’re a well-known manufacturer of high quality and practical cases for a whole range of drones and cameras. If you’d like to check out some other Polar Pro products, click here. Lets have a closer look at what makes the Polar Pro one of the best cases for your DJI Spark. The case itself is manufactured from a custom moulded soft shell that creates a rigid exterior. This acts as the perfect shield between your Spark and the outside world. The beauty of the Polar Pro case is that it’s super compact; it’s able to fit inside another backpack with ease, therefore adding another layer of protection. Don’t let the term ‘soft shell’ fool you; this thing will do a great job at protecting your drone from those unavoidable bumps and knocks. The Polar Pro aims to protect your drone whilst still maintaining the compact design of the DJI Spark. In other words, this is the perfect sized DJI Spark case for travel. The cases custom mould means that the Spark fits perfectly inside, preventing it from getting thrown around whilst you’re on the move. Inside the case you’re able to fit the drone (with props installed) and two spare batteries. Alternatively, you could opt for one spare battery and a charger. Both of which fit seamlessly inside the Polar Pro. The Polar Pro features an external carabiner loop that allows you to attach the case to you’re backpack. 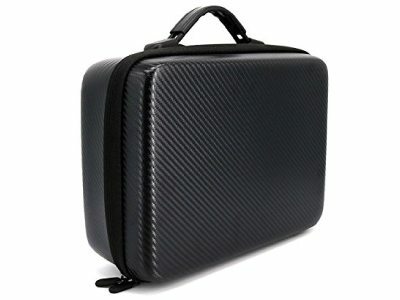 If you want a case for your transmitter, you’ll have to buy one separately as it’s unable to fit inside the Polar Pro. This case is undoubtedly one of the best DJI Spark cases for travelling. If you’re constantly on the go and looking for a compact and protective case for your Spark, the Polar Pro is for you. ​Takes away the compact element of the Spark, as it’s slightly large. The next item on our list of the best DJI Spark cases is the Deyard travel case. If you’re looking for a portable solution for both your Spark and your accessories then look no further. The Deyard ticks all the boxes; it’s cheap, practical and will do a great job at protecting your DJI Spark. Lets get to it. Deyard wern't taking no chances when designing their portable carry case for the DJI Spark. It’s anti shock foam lining acts as a great barrier for your drone, as it will absorb most of the impact from any knocks it may endure. The cases leather waterproof exterior means that you don’t have to worry about getting caught out in the rain. If you do, just get your Spark quickly inside the case and run for cover! As with all hard shell cases, they’re designed for those of you who wish to take no risk when transporting your drone (with fair reason!). You’d have to put the Deyard through some serious damage to break the drone inside! All this protection is great, but what can it actually fit? If like me, you’ve got a fair amount of accessories for your drone, the Deyard is a great option as it provides plenty of space to safely store your equipment. The foam inside the case is cut specifically to fit the DJI Spark, 2 spare batteries, a transmitter and charger. Wait, there’s more. Along the top of the bag is a mesh pouch that’s perfect for storing accessories such as tablets. The best part? It's extremely affordable for what you’re getting. Some cases can set you back a fair amount of money, however you can sleep well at night knowing your drones safe and sound and for an amazing price! What do you think? One of the best DJI Spark cases? Now this is one heavy-duty case for your DJI Spark. This case pays homage to the old school carry cases used back in the day, and for good reason. It would take an atomic bomb to get through this case and break your DJI Spark. Even then I’m not sure, this things built to last! So, what makes this one of the best DJI Spark cases? This is for those of you who are outdoors a lot with your drone and don’t want to take any risks, and why would you? 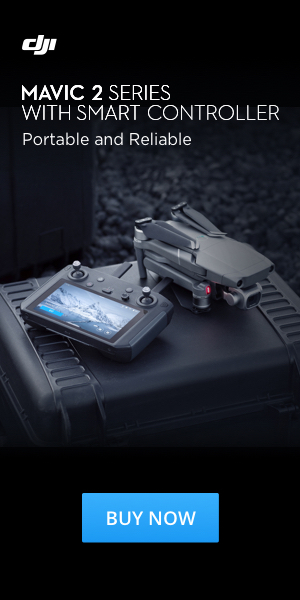 The professional carrying case for the DJI Spark is IP 62 water and dust resistant. This basically means that dust wont be able to get inside the case and that if you’re to get caught out in a shower of rain, the chances are your drone will be fine. A layer of foam is located on the inside of the lid, which is great because it means that your drone isn’t going to be banging against the tough material of the case. Although, I doubt the drone would even come lose, so you don’t need to worry about that. The inside foam is cut to precision specifically for the DJI Spark and its accessories. This means that your equipment will slide nicely into place and stay there for the duration of your transit. You’ll have no shortage of room either as this bad boy can fit 4 spare batteries, a transmitter, the DJI Spark and charging cables. ​In other words, it can fit abseloutely everything you’re going to need. 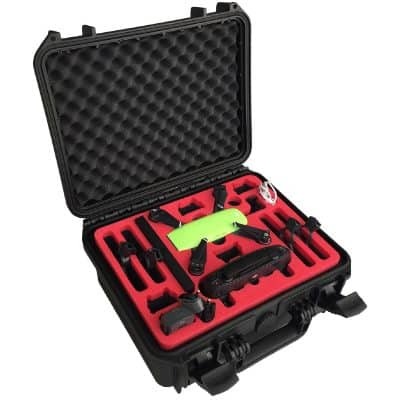 ​If you’re frequently travelling with your drone then this professional standard carry case is a great option. It does a fantastic job of protecting your drone and wont break the bank either. Definitely one of the best DJI Spark cases around! Fits a serious amount of accessories! Moving from one heavy-duty case to another, next up we’ve got the MC Cases (Multi Copter Cases) professional carrying case for the DJI Spark. If you’re serious about protecting your drone and have a lot of accessories, the MC is one of the best DJI Spark cases for you. The build of the MC case is extremely tough and durable, which is complemented by a soft foam interior, creating a seriously protective case. The case is IP 67 water and dustproof, which means that is it more waterproof than the professional carrying case that we just discussed, however it does cost slightly more. It’s up to you whether you want to invest a little bit extra for a more watertight case. Both will protect your drone in showers, but the MC case will protect your DJI Spark from a heavier downpour. The MC Case has a trigger release latch system so you don’t have to worry about the case opening in transit, this thing will stay shut! Want to know the best part? MC Cases offer a lifetime replacement guarantee, so if you’re not happy with your case, you can get it replaced easily for free. Shall we have a look at its storage capabilities? 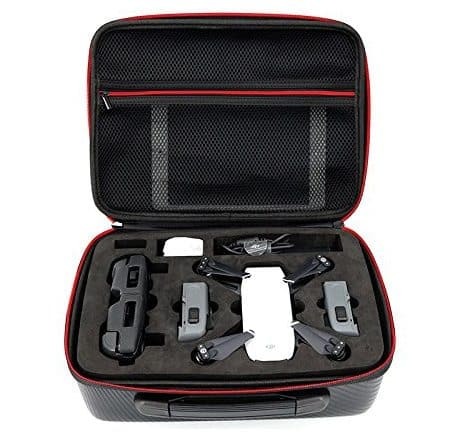 You’ll have no shortage of space with the MC carry case as it has plenty of room, which is great if you’ve purchased the fly more combo kit with your Spark. You’ll be able to keep your spark up in the air for a serious amount of time, as the MC case allows you to store up to 6 batteries (one inside your drone). Yes you read that right, 6 batteries! 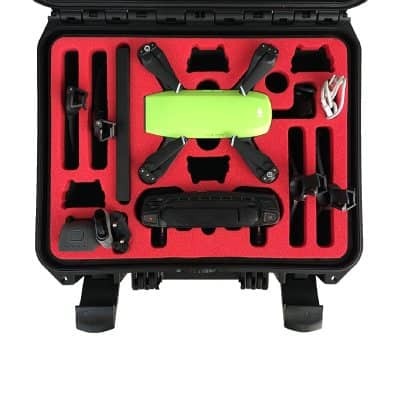 The MC Case can store your DJI Spark (with props attached), 6 batteries, 8 spare propellers, 4 prop guards, your transmitter, charger, smartphone, cables and 4 SD cards. That’s a serious amount of room, fair play MC Cases! The inside foam is jet cut with precision specifically fore the DJI Spark, meaning that it will fit your Spark and accessories flawlessly. It’s safe to say that the MC carry case is one of the best DJI Spark cases out there! CaseSack DJI Spark Case – Crazy Cheap! Moving onto the CaseSack DJI Spark Case. 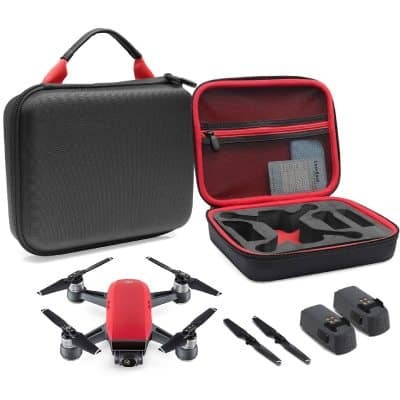 This great little case comes in a variation of colours to match your DJI Spark. 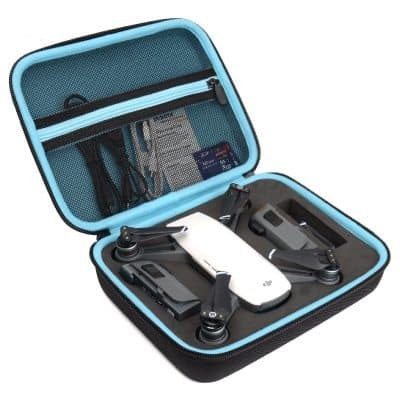 The CaseSack is incredibly affordable and unbelievable value for money; making it one of the best DJI Spark cases out there! The CaseSack offers a great amount of protection for your DJI Spark, considering how cheap it is. The cases’ exterior is made from a semi-hard shell material that creates a lightweight, rigid frame. 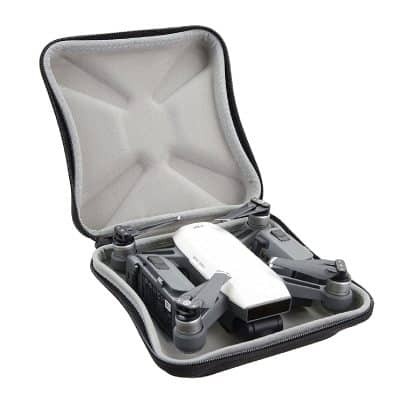 The interior of the case sack is fitted with an EVA material, with custom punched holes to fit the DJI Spark and accessories. This allows the DJI Spark to rest safely and securely inside the bag and will protect it from any impact the bag may encounter. The CaseSack is designed for drone pilots who do not have a large amount of accessories for their drone. 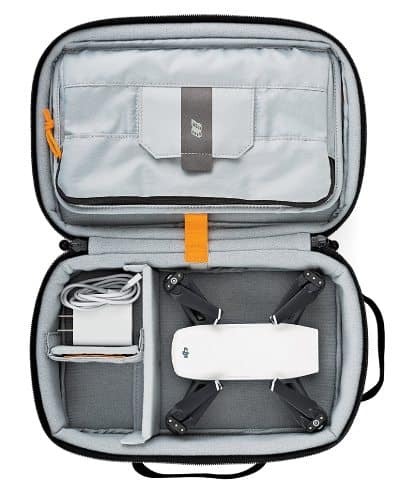 If you fly your drone using a mobile device and do not have a transmitter, the CaseSack is a fantastic choice. 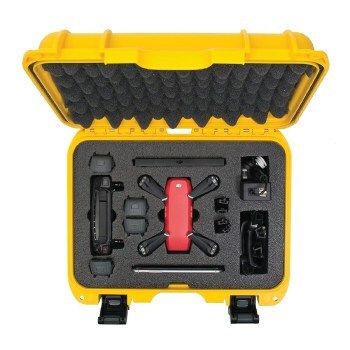 You can however fit 3 batteries inside the case, with 1 inside the drone and the other 2 in their custom compartments. The CaseSack also features a mesh compartment that can be used to store any cables you may have or even a tablet. It’s safe to say that the CaseSack is designed for pilots with minimal accessories. Considering how cheap it is though, any pilots who are looking for something simple and affordable should consider the CaseSack. The final bag on our list of the best DJI Spark cases is the Power Extra Shoulder Bag. 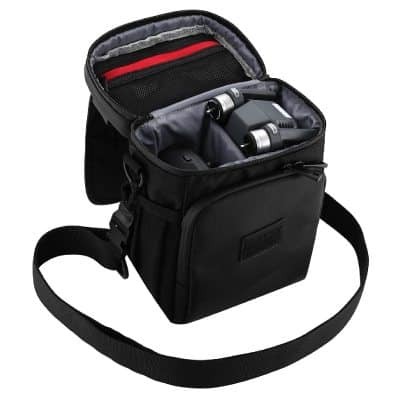 This bag is a great option for those of you who are looking for an easy to carry and protective case for your Spark. Weighing only 14.2 ounces, the Power Extra will allow you to easily transport your DJI Spark from a to b. Although small, the Power Extra bag offers a nice amount of protection for your drone. 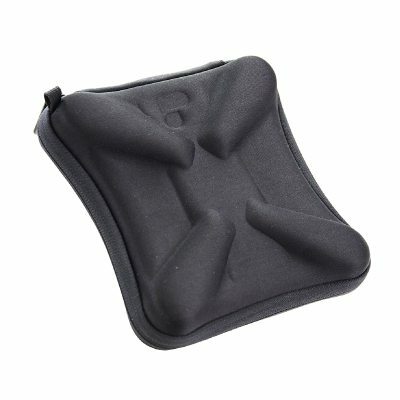 The inside of the case is extremely well padded and perfectly sized for the DJI Spark. This allows your drone to rest comfortably inside and be protected from any bumps. The Power Extra has limited storage space and is designed for people who are looking for a compact way of transporting their DJI Spark. Inside of the bag you can fit both the DJI Spark and a transmitter. There is also a mesh compartment at the top that is perfect for storing ND filters or cables. One of the best aspects of the Power Extra is how convenient it is to carry. 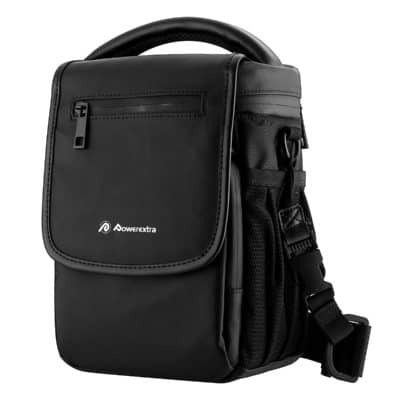 You have the option of carrying it as a shoulder bag or using the carrying handle on the top. It has received some great reviews on amazon, all praising the case for its portability and ease of use. It’s safe to say a lot of people would deem this one of the best DJI Spark cases. Thanks for taking the time to read our list of the best DJI Spark cases & backpacks. We hope that you’ve found this helpful and informative, and as always if there’s anything you’ like added, feel free to comment below. Happy flying! Just wanted to say thank you for the article! I’ve just received my MC cases and couldn’t be more happy with it. I have no doubt that it will last a long time and feels as sturdy as a rock. Thanks again, I was a bit confused before reading this but you really helped! Thank you for the article. It was very helpful. Very helpful article. 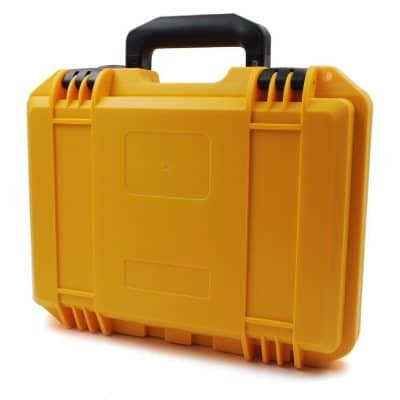 I am interested in the yellow hard case, but could not find it in the link to Amazon. Could you give me the manufacturer’s name or website details, lease.